My first food memory was eggs benedict at the Mayflower Hotel in Washington DC. I was not a big fan; the hollandaise sauce confused me. I was 6 at the time and have learned my lesson. My first GOOD food memory was in Paris. I was 14 at the time, exploring Paris with my aunt (who speaks fluent french thank goodness), and cousin, eating everything in sight. Paris gave me my first taste of goat cheese, first hazelnut crepe, first sip of red wine, and many more. Dining for hours, no tvs, no smartphones, just people eating together and enjoying the moment, everything about the food culture in France enchanted me. You can feel the love in their food. Or maybe it's just all the butter; either way it is so good. Since my family is coming to Bloomington to visit, there's no traveling for me this Thanksgiving. But last week I decided to do the next best (and cheapest) thing... cook my way to France via beef bourguignon. I'm not sure where I had my first bowl but it is one of my favorite French dishes. It’s rich, delicious and perfect for this time of year. To make it even better, I had some local ingredients delivered to my doorstep for said stew. I love spending Saturdays at the Bloomington Farmer's Market but I've been traveling on the weekends lately making it difficult to get the local ingredients I want to cook with. Cue: Green Bean Delivery. They are a grocery delivery service with a focus on organic and local ingredients. Supporting local farmers and food is important to me so I was excited (and pretty surprised) that everything I ordered in my bin was either from the Indiana, Ohio, or Michigan. The whole process was so easy. The week your bin is scheduled to arrive, you'll receive an email alert that the online store is open for you to choose your groceries. There are several different sizes of bins depending on how big your household you need and you can customize them to your needs. For example: I can’t afford all local and organic items so I opted for a smaller bin with all regional produce (broccoli, butternut squash, maitake mushrooms), a loaf of Amelia’s Bread from Indianapolis (SO GOOD), and some stew meat from Seven Sons in Roanoke, Indiana. If you want an idea of the selection, click here to tour a bin. The Green Bean bin arrives on your doorstep packed in a cooler with freezer packs so the food is safe until you get home. (When you get your next delivery, they’ll pick up your empty bin to be reused.) I timed our delivery to show up after my trip to Lexington so I didn’t have to make a grocery run all week. Because all of their stock is local/organic, availability changes week to week so plan your meals accordingly. 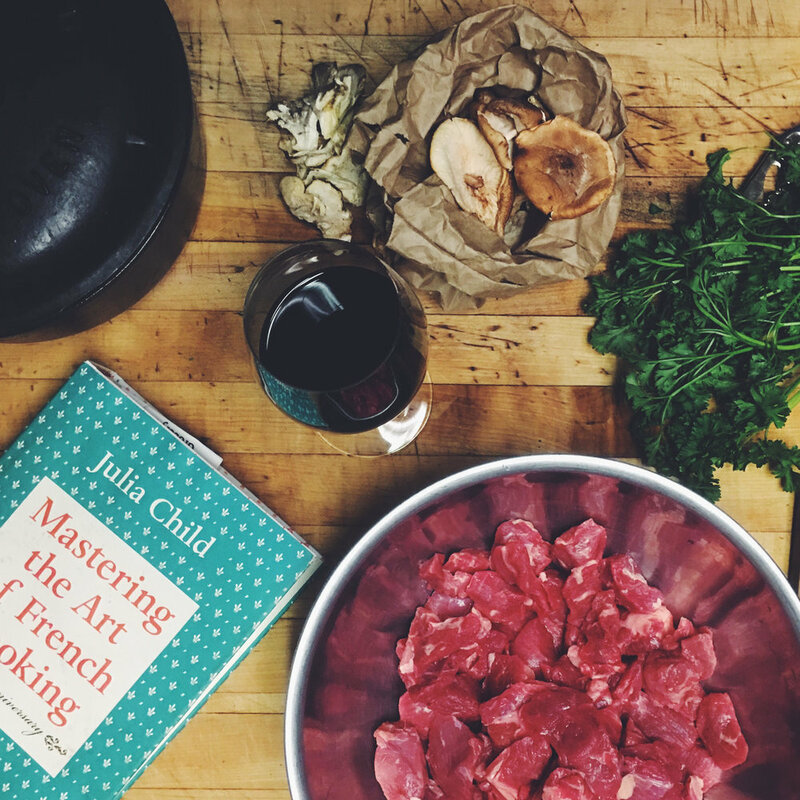 There are a lot of recipes out there for beef stew but Julia Child's recipe in Mastering the Art of French Cooking is my go to. It takes a long time to make but it is worth it! I used the stew meat and some cultivated shiitake mushrooms from Shiitake Shamrock Farms in Arlington, Indiana from my Green Bean Delivery along with other items that we already had at home. You know we love mushrooms so I added an additional pound of wild maitake mushrooms that we had leftover from our last pick in the woods. Good bread is essential for soups and stews. I could've picked a baguette to go with the stew but I wanted to try something different and settled on their City Loaf (white sourdough) to try in my bin. It made for an excellent grilled cheese too. Once you're tired of turkey next week, give this recipe a try. Honestly, I never thought I would use one of these delivery services but they made it really easy to eat well and support local farmers without spending a ton of time or money at the store. They got bonus points for reusing their coolers and bins. Green Bean Delivery was kind enough to provide a discount code to my readers so you can try it too. Use code: EmsRoad with your first order for $15 off! Fine print: The offer expires on Dec. 30, 2016. Please note that this promo code is valid for new members and reactivations only. Limit 1 per household and cannot be coupled with any other GreenBEAN Delivery discount or promotions. Wishing y'all a Happy Thanksgiving! When you've had enough of turkey and are ready to get back in the kitchen, give this recipe a try. This post is sponsored by Green Bean Delivery but all opinions are my own.